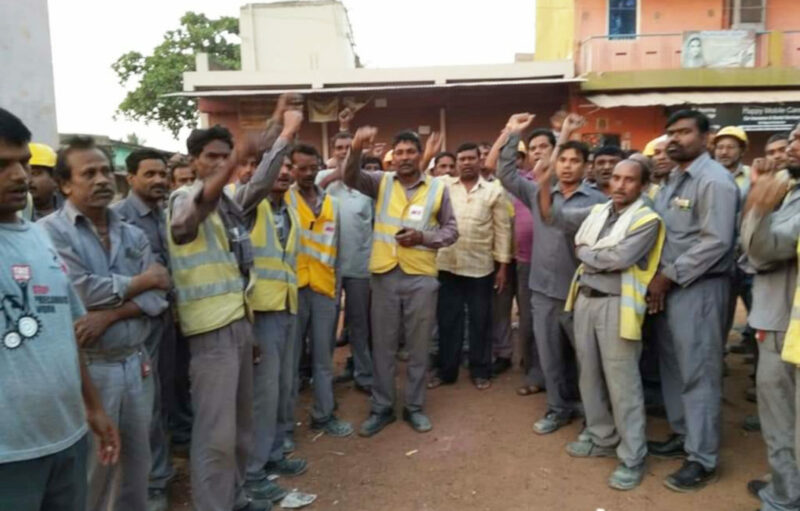 Workers in Bhilai condemn the arrest of worker-leader, human right activist and peoples lawyer Sudha Bharadwaj, calling it an attack on the working class and toiling masses. The Jagdalpur Legal Aid Group and Collective strongly condemns and mourns the incidents of arrest and police remand of Advocate, friend, mentor, and colleague Sudha Bharadwaj and calls upon a collective expression of solidarity and strength from all activists, students, lawyers, democratic rights and civil liberty communities, friends and the general public. We also denounce this ongoing onslaught on other activists, lawyers, writers and professors, including Advocate Surendra Gadling, Advocate Arun Ferriera, Professor Shoma Sen, Vernon Gonsalves, Mahesh Raut, Varavara Rao, Gautam Navlakha, Sudhir Dhawale, Fr. Stan Swamy, Rona Wilson, Anand Teltumbe and several others who are being implicated by this mesh of lies and deceit spun by the Pune Police. 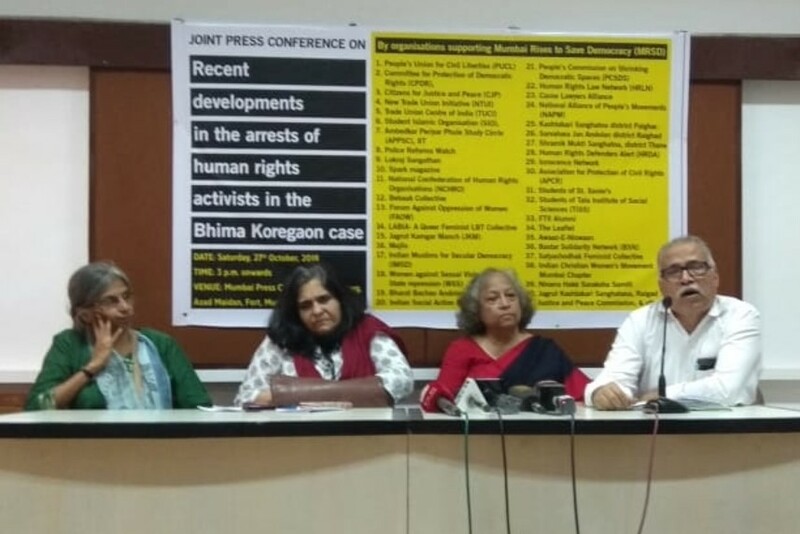 Coordination of Democratic Rights Organisation (CDRO) strongly condemns the arrest of activists and lawyers Sudha Bharadwaj, Vernon Gonsalves and Arun Ferreira by Maharashtra police on the rejection of their bail petition by the special court of Additional Sessions Judge K D Vadane in Pune on 26.10.18. 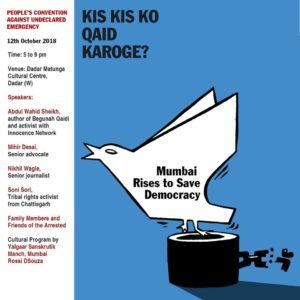 Mumbai Rises to Save Democracy (MRSD) press release condemns the continuous hounding of the human rights activists, people lawyers, trade unionists and other voices of dissent by the Indian state and use of draconian law like UAPA to imprison them for years without bail. The press statement also highlights the failure of the Maharashtra government to contain the violence unleashed by the right wing Hindutva groups. Women Against Sexual Violence and State Repression (WSS) condemns the majority judgment of the Supreme Court regarding the arrests of Sudha Bharadwaj, Vernon Gonsalves, Arun Ferreira, Gautam Navlakha and Varavara Rao. We, the members of civil society and more than 40 rights organisations including women’s rights organisations, dalit rights organisations, adivasi mass organisations, legal aid and research organisations, environmental groups, trade unions, students etc., have come together to register our condemnation of the continued hounding and reprisals by the state of human rights activists arrested allegedly in the Bhima Koregaon case. Council of Bars and Law Societies of Europe writes to PM Modi on arrests of Arun Ferreira, Sudha Bharadwaj. A Pune Court has dismissed the bail applications filed by Sudha Bharadwaj,Vernon Gonsalves and Arun Ferreira, who are under house arrest in relation to FIR registered by Maharashtra police for alleged Maoist links in Bhima-Koregaon violence.